Why do we study Business Management? "Management is a multi-purpose organ that manages business and manages managers and manages workers and work." Amongst the best MBA colleges in Kolkata, JIS University is offering the latest management programs at undergraduate and postgraduate levels. The university aims to provide international level education to the students and making them industry-ready. At JIS University, we offer highly-innovative and rigorous management programs designed to develop the professional capabilities of the future managers. The curriculum provides real-life practical experience to the aspirants and makes them work-ready in their selected specialization. School of Management Studies of JIS aims to educate the professionals who will work with integrity and are trained to contribute to different sectors of society. The students are equipped with the latest business knowledge so that they can understand the complexities of the global corporate sector. Being among the best BBA colleges in Kolkata, we offer professional degree programs with the right mix of theory and practical exposure which the industry demands. The programs offered by the institute expose students to the industry, right from their first year which helps them to be job-ready. Apart from the regular classroom sessions, we offer the management education through innovative pedagogy like case studies, research, internships and value-added programs including guest lectures by industry experts. We are one of the best MBA and BBA colleges in India that places strong emphasis on the application of management knowledge by organizing various events and case studies for the learners. We are proud of our faculty members who are the real torch-bearers of our school and have strength to impart case-studies based education to the students. Our faculty has adopted innovative teaching methodologies, providing in-depth knowledge of modern management to the students. We enable the aspirants to utilize the advanced concepts of management and prepare them for decision-making. Eligibility: 10+2 from any stream with a minimum of 45%* marks. Under Graduate Aptitude Test (UGAT) qualified candidates can directly apply for GD/PI. Eligibility: 10+2 from any stream of studies with minimum 50% marks. Eligibility: Graduation from any stream of studies with minimum 50% marks. Human Resource Management, Marketing Management, Financial Management, Information Technology, Business Analytics, Media, Tourism, Retail, Pharmacy. Eligibility: 10+2 from any stream with a minimum of 45%* marks with English as one of the subject. Selection Procedure: Through JIS University online examination, specialization-wise written examination and interview. Management is not a Laboratory based subject. Yet we practice extensive business communication practical classes in our latest state of the art Language Laboratory. Beside this, from time to time different management workshops are done where different management games are being played and skills are being imparted to enhance the logical and analytical skills of the students. Besides having access to eminent and experienced faculties, huge library, fully equipped computer laboratory and state of art class rooms, the students are also given thorough real life corporate experiences through corporate/ industry visits, summer internships and on-job training. Eminent professors and management personalities from different parts of India and abroad visit the University from time to time to enlighten the students with latest developments and updates in the management field and the techniques adopted in various fields of management. The Business Management department has already made a mark in the Indian Management Academic field. There are more than twenty five Doctoral Research students who are working efficiently and pursuing their research work in varied areas in this department. Beside this, both the faculty members and the students had attended different national and international seminars throughout India and abroad, read papers in many prestigious seminars and published more than 25 papers in different reviewed journals. The members of the JIS University have represented the University in Indian Management Conclave in IIM, won the best paper awards in International Seminars at SMS Varanasi, Vidyasagar University, Jawaharlal Nehru University, IIT Kharagpur, IIT Madras, IIM Ahmedabad etc. Renowned personalities have been a part of the institute as leaders and teachers. The Board of Studies comprises distinguished industrialists, academicians and famous personalities. The hallmark of this Management School is, not to walk on the already beaten path, but to strike new unknown routes; not to benchmark, but to be benchmarked; to be second to none, but to be the first to respond to the needs of the students aspiring to become global managers. 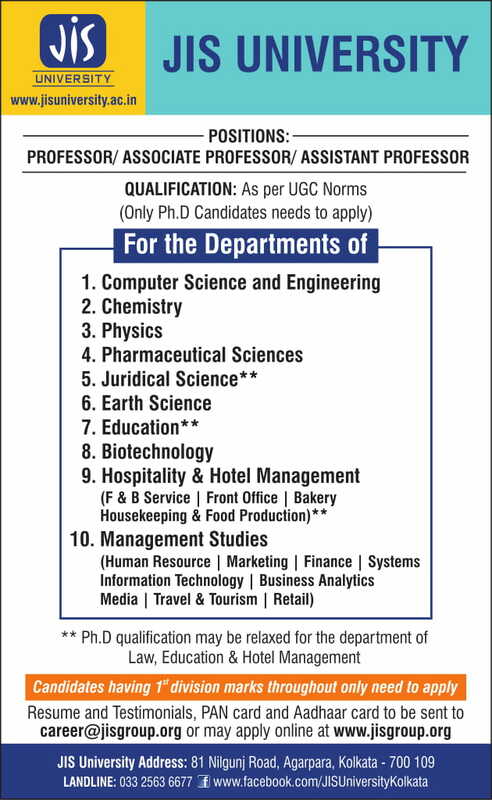 Beside these, numbers of research works are being carried out the faculty members of the department in varied interdisciplinary areas. They have also received various awards for their research works of national and international rank. Eminent educationalist like Dr. Alok Sen, Dr K.B.L Srivastava (IIT, Kharagpur), Prof. Basab Chowdhury (VC, W.B. State University), Prof A. Mitra (J.U), Prof. Ranjan Ghosh ( Ex- Director, IIM Kolkata) are to name a few who have come to deliver lectures, interact and groom the management students of JIS University. The Management courses in School of Management Studies are designed to train managers who could be effective in the business, government, and non-profit sectors, and who would have the skills, understanding, and perspective to move among those sectors effectively. The management programs are designed to give students a more in-depth understanding of the business world, and prepare them for successful careers as leaders, managers, executives and innovators in their chosen field. JIS group has got an excellent placement department where they place thousands students in different companies throughout India. Even then, the University encourages students who dream big to have their own organization in future and generate employability for the future generation. To explore the entrepreneurship skills within the University students, every year University organizes an innovative exhibition named SKILLX, whereas students from all fields of study make many new products which are one of its kind. The students not only exhibit these products but also try to do marketing, advertising etc of the product so that the product becomes viable in the market and they also learn the management skills in real time interface. This has already triggered and motivated many young students to think and dream along the path of entrepreneurship. Beside the regular academics, the students are also encouraged to take part in different co-curricular activities like sports, music, dancing, art, theatre etc. The students are encouraged to do on job trainings and Internship from time to time within the course tenure which helps the students to gather a holistic knowledge about the subjects. The Management course will have dual specialization in Human Resource Management, Marketing Management, Financial Management, Information Technology, Business Analytics, Tourism, Media and Pharmacy. 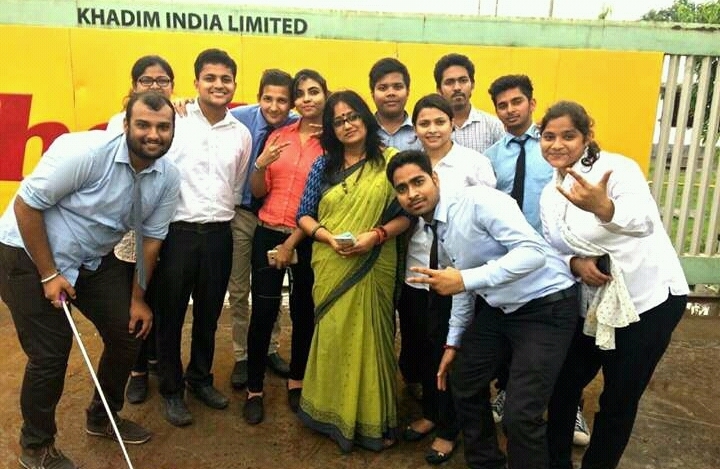 The students opting for different specialization will have job opportunities like Employee Relations Manager, Employment Analyst, Human Resources Manager, Management Consultant, Financial Analyst, Accountant, CPA, Marketing Consultant, Compensation and Benefits Manager, Retail Analyst, Supply Chain Manager, Business Analyst, System Analyst etc. The students after pursuing PhD can apply for Faculty position in different Universities and Colleges. Extensive research work is being carried out by the PhD students of the School of Management Studies. The PhD students are also encouraged to present and publish scientific papers in national and international journals and conferences. 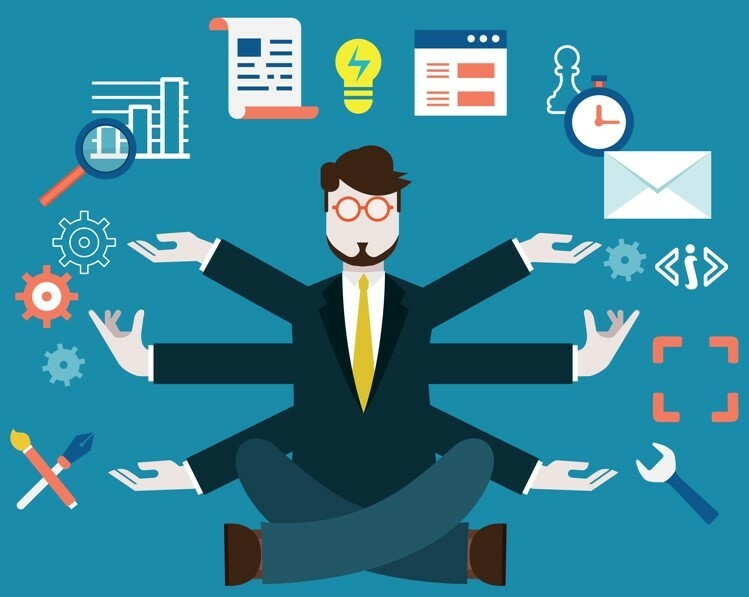 There are about 25 Ph.D students working in different areas like digital marketing, consumer behaviour, hospital management, rural management, green marketing, behavioural science, organizational structure and behaviour, different aspects of human resource management like recruitment, appraisal, retention, training, etc. Extensive research work is also being carried out in different areas of Financial management. Number of research papers authored by the research scholars of the department has been published in different renowned national and international journals. They also present papers and attend seminars, conferences and workshops in different parts of India.